I was extremely thorough when I started researching options for permanent makeup, and had been fascinated with the idea of it since high school. After over a year of extensive research and after having my top eyeliner done while living in China (I explored permanent makeup options in Asia first since the trend originally started in that region of the world), I came back to the states and found Renee. I set up a consultation and it was by far one of the smartest decisions I have ever made. She did my bottom eyeliner using her lash enhancement technique (where she fills in between the lashes so it's not a solid dark line). I was amazed and so happy! It looked completely natural! My 60 year old mother was so impressed that I got her the procedure (top and bottom) for her birthday and she now looks as least 10 years younger. She couldn't be happier! I then had Renee do my lips (liner and full lips). I didn't realize how thin-to-nonexistent my top lip actually was, but Renee reshaped and filled out my lips to a full, beautiful pout. The color is the same color that you get when you exfoliate your lips with a washcloth after a hot shower - that beautifully natural flushed rosy look. It makes my whole face look softer, younger and more feminine. Renee is awesome at what she does and her work is very high quality. I have had several procedures. Renee is awesome at what she does and her work is very high quality. I have had several procedures with her, including eyebrows, eye liner and lips. She did a great job on all of them and her recommendations were spot on. They looked natural and I have had many compliments by others as well. I have noticed that sometimes customers dont heed the advice she gives when she cautions them on what they want to have done. She provides alternative solutions and she explains her reasoning in detail. No, she is not cheap but it is definitely worth it. I am writing this testimonial to show how Renee changed my life. I've been to medical Doctors, Psychologists, tried medication for 31 years, but nothing worked. I have Trichotillomania which is an irresistible urge to pull out hair from your eyelashes, eyebrows or other areas of your body. Up to 11 million Americans wrestle daily with an overwhelming urge to pluck hair from their own bodies. For 31 years I've lived with the feelings of shame, humiliation and embarrassment and experience low self-esteem, depression and anxiety because of this condition. Embarrassment because of of my sparse or missing eyelashes and eyebrows have lead me to avoid swimming, working out, certain kind of haircuts and was constantly running to the bathroom to make sure my make up was still on my eyebrows and around my eyes so no one would notice. I've worn bangs most of my life to cover my eyebrows and never left the house without my eyebrow and eyeliner make up to constantly reapply. I would wake up before my family to "put on" my eyebrows and eyelashes for fear that my condition will be discovered by the people closest to me. In case you are wondering, I am a college graduate with a successful career, wonderful children, husband and friends, and others consider me very naturally pretty. No one would believe I would not have the control or will power to stop doing something I desperately want to stop doing. Although, after 31 years of trying to stop and being unsuccessful, my goal is still to stop. With that said, I never heard about permanent makeup and when I did I thought that could be a solution to my problem. I did extensive research and found that Renee was the best, so I went to her. Renee did permanent make up hair line strokes for my eyebrows, permanent make up eyelash liner on top and bottom with permanent eyelash enhancement , along with lip liner and full lips. I can't even put into words how this has changed my appearance, confidence and how much time it saves me. I couldn't be more thrilled. I wish I new about her 31 years ago. She has a life long patient with me and I'm writing this in hopes that others with this problem realize how she can change your life. Renee is professional, years of experience and many happy clients. Her facility is clean and sanitary. Renee listens to what you want and will make professional suggestions and will do touch ups to continue to perfect the look you want. Renee, I can't thank you enough for what you have done for me. As I look in the mirror, I can't believe I waited so long to get permanent makeup. No longer do I have eyebrows that are totally different shapes. It's hard to believe I don't have to do anything to get my face ready for the outside world. I wake up in the morning and look good. I go to the beach and never worry about smeared or running makeup, or touching it up to look fresh again. Just having my eyebrows done makes me look ten years younger. There are a lot of people to choose from when considering permanent makeup. Trusting my face to the lowest price practitioner has never been an option for me. For me, choosing a permanent make up artist is like choosing a plastic surgeon. If I wanted someone with a lot of experience (not just in performing procedures but also teaching others), someone who people choose to correct mistakes made by other practitioner, someone who keeps the work area impeccably clean and disposes of needles after each person, and someone who cares about each client, I had to choose Renee. She even picked the most attractive colors and shapes for my features! I always hated how washed-out I looked without makeup. In fact, I would go to extremes to keep people from seeing me without my 'face' on. But after being transformed by Renee, I don't have to put on makeup before going to the gym, and I don't have to sleep in my makeup to wake up beautiful. I can't tell you how liberating it is to just roll out of bed and be ready in 10 minutes. As I get older, that hour I save each morning becomes more and more important. Thanks Renee! Renee is a truly gifted artist. Her technique is perfect. She has an incredible eye and is able to spot imperfections from a mile away. Her procedures on me caused much less trauma and pain than any other artist with whom I had worked. I healed much quicker and with less pain also. Many people who do permanent makeup should not be doing it. They do not have the skill. Renee can correct their mistakes. Having Renee do your permanent makeup is like having an expert makeup artist do your makeup every day. I love my new brows and even lips! I have been embarrassed all my adult life not having eyebrows that weren't drawn in. Renee has changed my life! My lips are now even and all I have to do is a little gloss and go. It is the best thing I have ever done for myself! I don't even know where to begin. When I was doing my research on permanent cosmetic procedures, I came across your website first. However, because of the distance, I desperately wanted to find someone closer to home. Therefore I continued to search, yet I always found myself going back to your website before turning my computer off for the day. I finally called your office(after 5 months of contemplating), and within seconds of speaking with you I knew distance no longer mattered. You exuded a great deal of confidence and knowledge that was wrapped in genuine kindness. What you have done for me is the difference between a TECHNICIAN and an ARTIST. Renee...you were meant to do this work. The pictures on your website are incredible yet they do not do your talent justice by any means. I am embarrassed to say that at the age of 35, I still try to avoid mirrors. I do not think that will be an issue any longer. Thank you for giving me the confidence I've always wanted. To future potential customers: Do not hesitate to work with Renee. I promise that you will be singing her praises just as I am. I found Renee by doing a websearch for permanent makeup. I was very impressed with the information so I called and made my first appointment to have permanent eyeliner done. The staff went out of their way to make sure I was comfortable and at ease with my choice. The rooms were clean and everything looked sanitized with the comfort of the client in mind. Renee discussed all of my options and went over with me how the skin changes with age and how to take care of my face. I had my eyebrows, top eyeliner, and bottom eyeliner permanently done. Through the procedure, Renee made sure to work with me on how wide and thick to make the eyeliner and having me check to make sure it was what I had in mind. After the procedure, I kept looking in the mirror as I drove home; and after about an hour called back and made an appointment to have permanent lips done. I told her to just do your magic. Everyone loves the work Renee has done on my makeup - I feel younger and refreshed. I trust Renee's judgement and do recommend her work to all my friends. I am 60 years old and, obviously, with fine lines and wrinkles. My makeup was constantly seeping into the wrinkles, making me look older, and I had to pay constant attention to my makeup, because looking good is very important to me. I met Renee at the Dallas Bridal Fair approximately two months ago. I looked at her literature and was very interested in the concept of permanent makeup (which seemed to me would revolutionize my life and give me a lot more free time - time that I usually spent "putting on my face"). After 36 years of marriage, I found myself single again and working three jobs - which didn't leave a lot of free time, and time was very valuable. After meeting Renee at the bridal fair, I read her literature and gave her a call the following week. I felt it was very important to do my homework, so I asked for names of her clients, which she readily provided for me...I called them and actually went to visit one of them...All of her clients gave her "raving reviews." With all this ammunition, I made the appointment and had my eyebrows, upper and lower lids, and lips done - all at one time! I can tell you, it was one of the best things I have ever done for myself! I constantly get compliments. Incidentally, I have met the man of my dreams since then, and we plan to be married within the next few months! Life is good! Thanks, Renee! I want to thank you so very much for the fantastic job you did on my new eyebrows!! I was just so overwhelmed with everything yesterday seeing a look on myself that has been missing for so long that I don't believe I was able to really show you the excitement I was feeling. I just can't get over the huge difference it has made. I can't wait to see how they look when everything settles down. I'm feeling really good, just a little bit of tenderness. There is quite a bit more redness today, but I expected that! Everyone has been very complimentary of the new look!! I have attached a PowerPoint presentation with my before picture, one immediately after in the car, and two from today (with and without my glasses). By the way, I did wear my visor all the way in the car while the sun was shining, and I appreciate you calling me back to put the sunscreen on my brows. That just confirmed with me your level of professionalism and commitment to your work and customer. I will be sure remember to wear the visor and put sunscreen on the brows when I'm outside or in the car during the day until everything heals. I want to again compliment you on the amount of information contained in your website. That information gave me the confidence to have a decision made prior to coming to your facility. Your work spoke for you before I even met you. But you made me feel very comfortable and, seeing how picky I was, made me feel assured that you would do everything to make my brows exactly as I wanted them. The other thing that I really appreciate was how comfortable and important Felix made me feel on the telephone and in person. He was so kind and informative and made me feel like he already knew me. I'll be back in touch with you in 4 weeks about the brows and later I'll contact you about the skin tightening and possible other skin procedures. You can be certain that I will pass your name along to all my friends & colleagues. Thanks again for an excellent job! I am a natural strawberry-blonde, so my eyebrows have always been a problem for me. When I lost much of my eyebrows due to a hypo-thyroid issue, I decided to start looking into permanent tattoos to help. It was seeing my unevenly drawn eyebrows in a picture (I lovingly called it my Cruella Devill look), that finally caused me to seek out a permanent makeup artist. After researching the Internet, I found Timeless Beauty by Renee and made an appointment. 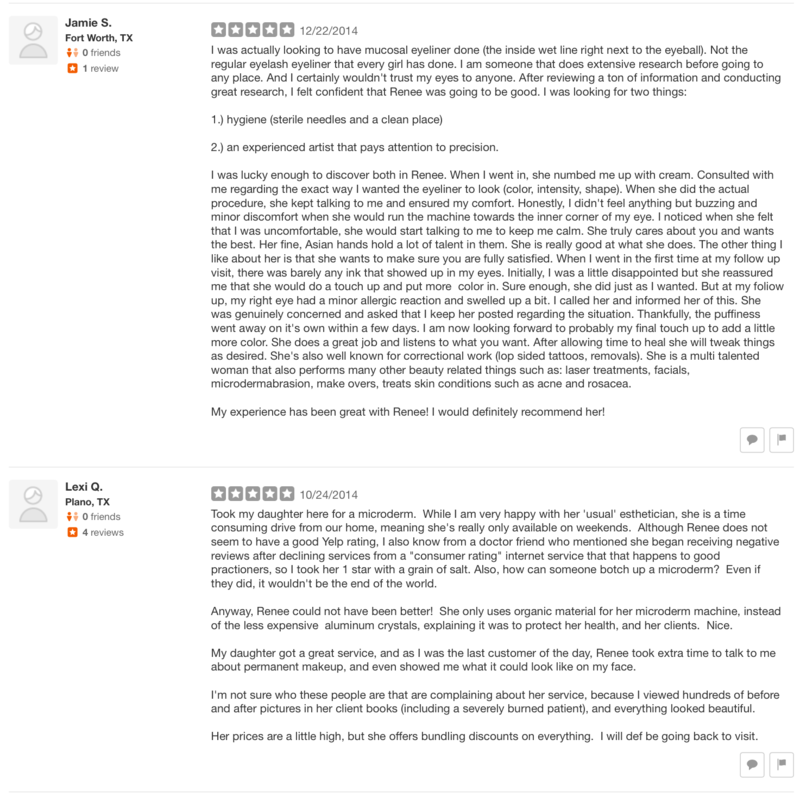 I knew from reading two of the reviews that she was possibly more expensive, but I truly believe that you get what you pay for, and you don't go cheap when it comes to permanent makeup on your face! After getting my brows tattooed by Renee with the hairline strokes, I loved the shape, but I was concerned about them being too dark (remember, redheads are not used to seeing dark eyebrows). Renee told me to trust her and that the color would calm down in a few weeks. Well, she was right! I get compliments on my brows all the time. The shape and color are amazing, and people are impressed when I tell them they are tattooed because they look so natural. In my teenage years, I followed every fad that came along. In the '80s, I was very much into anything that came from England, like Boy George and the Thompson Twins. So, being the mindless teenager I was, I shaved my brows. After so many years of abuse, my brows paid me back by not growing back in any discernable pattern. I can't tell you what a pain it was drawing them in every day (for years!) and worrying if they were even and fretting that they would be smeared during the day. Renee changed all that. She gave me my brows back!! And so much more......my confidence. I don't have to pull out my compact every 5 minutes to check my brows. When she was done with the procedure, I looked in the mirror and I actually cried. My very first feeling was that of relief. I feel so much better about myself now. It's just amazing how something like this can make all the difference in the world. I just wanted to share my day with you. Today was the first time in over 30 years that I did not wear foundation or consealer make up to work! !...I absolutely love my new look after my first laser treatment yesterday!! And I love the tinted moisturizer bronzer I bought from you. Last night I was so excited to get home to see my husband and show off the NEW ME! !...He loved the "glow" and how beautiful my skin looked. Funny after all that and we went to bed, he said "honey, I'm so happy that our happy with the outcome with Renee"...I told him that I feel great and I'm looking forward to my next appointment. My staff here at my office said noticed that I smiled A LOT TODAY. They too noticed the difference in my make up. They said it doesn't look so "cakey" and my smile shows how happy I am with my new Laser treatment. THANK YOU AGAIN FROM THE BOTTOM OF MY HEART FOR MAKING ME FEEL SOOOOO GOOD ABOUT MYSELF! I just wanted to thank you and tell you how much I LOVE my brows!! I'm so glad you were firm with me about the shape and thickness. I got used to seeing them after a couple of days and I've had so many compliments. It has been such an incredible relief to not worry about penciling them on, or worrying if they are still there. There are just so many ways they are helping me save time and gain confidence. Both the swelling and redness were completely gone by the next day, and the flaking has been so minor as to not really even be noticeable. I will take the time to write a glowing testimonial before my follow up appointment! Renee, I just wanted to say... that for years and years I always had to get up in the morning and apply an eyebrow pencil to my brows, sometimes it was either too thick, too narrow, or just simply not even. Until I found your website, of course, I would have never dreamed that I would like to have this done. I contacted your shop and spoke to you, you made me feel so comfortable being as scared as I was. I continued to call you every month, and strangely enough you actually talked to me everytime I called. I finally got up the nerve to come and see you and now I look GREAT!! I no longer have to apply pencils to my brows, and it seems like I have more time in the mornings because I don't have to worry about taking that extra time to make sure my brows are even and not too thick or too narrow. They are perfect everyday thanks to you!!!! Thank you for the new look Renee! I am so so so IN LOVE with my eyebrows! After 2 months of research and a recommendation from a co-worker, I finally took the plunge and I am completely happy and satisfied! It took me, I kid you not, 2 to 2 1/2 hours a morning to apply my eyebrows but now I am looking forward to waking up and going out the door without a thought or worry about my eyebrows. Thank you so much Renee! I love my eyebrows! LOVE ! MY EYEBROWS ! I had the hairline strokes and oh my goodness! They look so real and natural! I am one of the hardest people about my brows and I will tell you, it is unbelievable! It is definitely worth every penny! Renee designed my brows perfectly! She delivered detail & perfection. I highly recommend Timeless Beauty By Renee. Perfection, fun, and perfect! OMG! I love my eyebrows! I was kinda scared but I'm so glad I got them done. If you are gonna do it, do it right with Renee! I'm honestly so glad I came to you. It's so great to wake up to brows already done, knowing I only have minor tweaking to do if I want to look more "made up" but that if I don't, I can wake up or go swimming and have great brows no matter what. Many, many thanks. I just wanted to say thank you so much for the touch up you did for my eyebrows on Friday, you really are a miracle worker! I will always be extremely appreciative of you being able to fix my botched brows. Thanks Again! Hi, my name is Diana and I would like to tell you what Renee did for me. I have always had good eyebrows until I began to tweeze them. I ended up with no full eyebrow, just the first portion and no tail. I went like that for years content with drawing them in. I had been going to a nail salon/spa and found out that they were doing brows there. I should have known when I ask to see pics of the people she had done she showed me pics out of a magazine as examples. No real people, or guinea pigs, I should say. Anyway, after a lot pain and in total shock of what she had done my face, I walked out and went home to cry. In the days to come I would try to hide it with my bangs and waited for some of the darkness to die down. I was still hideous. After about 6 months I decided I would try to find someone who know what they were doing to help me, if possible. I was looking on the internet and found Renee. It not only showed you how professional the salon looks, it also has testimonials of real people and pictures of before and after. The thing that impressed me the most is that Renee teaches what I needed done. I made an appt. and started getting my problem taken care of. Renee and her staff are wonderful. I wasn't worried. She took all the fear out of me. I hope if you are reading this and are in need of someone to fix something that seems impossible that you trust Renee. I did and it was the best thing I ever did. Thank you so much for taking time out of your personal schedule to come to my rescue last Sunday! I am SO thankful. I still cannot believe I let someone talk me into doing my eyebrows when I just wanted some eyeliner, but I am forever grateful that you could fix it and were willing to do so. They looked SO horrible and I was sick to my stomach that I had made a life-long, irreversible mistake ON MY FACE! I am so grateful I found your site and all the incredibly helpful information you have on it. The FAQs and the Testimonials, in particular, helped me to realize that you might be able to help me when I thought no one could. I've never seen a site where there is so much real client, detailed info. and it was so helpful and comforting! I am glad I took action within 24 hours of the original work - the drive from Houston to Plano in a day was well worth it! They are healing up quite quickly, and I am confident that my brows will be totally back to normal soon. I didn't think that would EVER be possible after getting them permanently done! THANK YOU SO SO SO SO SO SO MUCH!!! They are still a little red and are going through the process of scabbing etc., but no infections and very little swelling after the first 2-3 days. Your idea of freezing cotton pads and putting them on my eyes for 10 mins at a time to help with the swelling was brilliant! It worked easily and helped the swelling go down much faster. I am already able to go out without anyone noticing and it's only been 5 days!! Thanks again for your warmth, compassion, time, and for helping me when I was so silly as to make such a big and lasting mistake. Your willingness to come in on your day off to help changed me every day for the rest of my life. That sounds extreme, but permanent eyebrows are for the rest of your life - so it's accurate! Thank you, thank you!! You are a real artist and genius to know how to fix the unfixable!! Words can't even begin to explain what an impact you have had on my life. At age forty-five, I found myself yearning to take the leap into the exciting world of permanent cosmetics. As a young, energetic high school teacher, I never worried about the need for very much make-up, and for many years, it seemed like I only needed a minimal amount anyway. So as those years flew by, as did my younger appearance, I was forced to begin a more painstakingly eye and brow make-up application. As my first ever cosmetic procedure appointment arrived, I was floating on air at the thought of the freedom I would experience with the permanent make-up. My choice of where to go for the procedure was easily decided upon due to the fact that I had gone to this up-scale salon and spa in Highland Village, Texas for a few years with some very positive experiences from a hair stylist there. Well, I soon learned that those experiences did not ensure the same would happen with their "Master Technician and Instructor" of permanent make-up. I ended up with two visits to this person from whom I would receive PERMANENT eye-liner, and PERMANENT brows. Although the appointments only took a few hours, little did I know that I was just beginning what would encompass one of the worst and most traumatic experiences of my entire life. I should have realized what I would face with the second procedure when at the end of the first, the technician couldn't get me out of the room fast enough while at the same time, telling me that I had "put her behind schedule for the rest of the day." I was also told to go to the restroom to clean my face from, what looked to me like, a mass of blotches of black ink everywhere. In her hurried attempt to get her next client in the room, she had still not explained to me the aftercare and I was handed the written instructions as I was going out of the door. Thus, not knowing what I was doing, I scrubbed ALL of the ink on my face, including the areas she had just done, picking and tearing at what was meant to stay on until after it healed. Also, I did not receive the written consent part of the paper work until afterwards, and she couldn't stop reminding me to "be sure to sign that and bring it NEXT time." Who knows, this may be what made the next appointment even worse. I guess I just tried to put the end of the appointment fiasco behind me, and hoped for a better experience as I returned for a (hard to get) 6 weeks appointment. Up front, we both agreed to schedule me for an hour and a half to two hours this time. Upon arriving, I sat waiting while she was approximately thirty minutes late getting there, all the while, saying she was contemplating not coming in at all that day; (me remembering how difficult it was to even get that appointment). So I handed her all the paper work I had signed, (wishing in retrospect that I had not done that), I laid down to receive the numbing gel to prepare for Permanent eyebrows. I knew from the first visit that once the gel was applied, she would be leaving me alone to allow time for the numbing to take place. What I did not expect this time, however, was the fact that she didn't return until over an hour had passed. The entire time that I was lying there looking at my watch, I felt like my appointment time was passing before my eyes. Before she numbed me, she assured me there would be plenty of time to use that appointment to do the PERMANENT eyebrows on what I had been noticing were vanishing with age. So, finally she made her way back to me in the room after close to an hour and a half. Time continued to pass as she walked in with a fellow employee and talked with her for close to an hour and a half. This followed by a phone call, and we were ready to go with what looked like to me, no time left to do anything, much less something that would be a PERMANENT fixture on my face. Well, she did complete the eyebrow procedure in a very quick amount of time, and proceeded to hand me a mirror. What she thought were "beautiful eyebrows" were to me, shockingly dark and crooked. It was as obvious as the walls around us that one was completely lower than the other. She became increasingly impatient with me, thinking I was crazy and I had just been given "perfect eyebrows" from as she called herself a "total perfectionist." Needless to say, I was very upset now, and in my mind she owed me appointment time to fix them. Well, guess what? The next thing out of her mouth was, "if I do anything more to you, you will be making me behind schedule for the rest of the day." I could not believe she had the nerve to give me that line, yet once again after all the time I spent waiting on her from the very beginning of it all. As I walked out, she went on to tell me that I could use lemon juice to lighten the (perfect brows?) when I got home. So, on the way home from the salon, I stopped at the store to purchase the lemon juice when a store clerk approached me to ask what I was going to use it for? After my explanation, she immediately replied, "you know, you do have one eyebrow that is lower than the other one." Well, that comment along with my husband's comments AND the excruciating pain I got from putting lemon juice on the open wounds, was all I needed to make a phone call right back to the technician. She proceeds to tell me that "I am the pickiest client she has ever had!" and as to the comment by the store clerk, she announces that "I should not ask someone what they think of my 'brows,' but instead, tell them that I just had my 'eyes' done, and what do you think?" Her final answer to the problem came when she told me that she can't do anything to them now anyway because "you are NOT supposed to remove the color right away." I hung up and immediately hit "rock bottom". I had a flood of instant emotions, many of which were that I had let vanity take over me and that I had in some way deserved what had happened to me. Enter Renee Cao into the picture: Renee, you took me in within hours of having the brow procedure done, "working me in" because you sensed the necessity of my problems. You ALSO knew from your past experiences in removing bad brows, that it was in fact CRUCIAL to remove the color as soon as possible to get it all out. Upon my arrival to your beautiful and relaxing salon, you briefly left your existing procedure to come to me with a warm hug and with the immediate acknowledgment that I had indeed just been thru a terrible experience. That is when the tears began to flow from my eyes, and I knew in an instant that I had NOW come to the right place. A few photos and condolences from clients later, you took me by the hand and you completely walked me through the color removal process. After the procedure was over, I left feeling like I would now have my face AND my self esteem back. I also knew that I had just encountered one of the most sweet and caring individuals I had ever known, AND one who was genuinely concerned about ME! I now have quite an investment in my new eyebrows and liner correction as well; not only a financial investment, but one of past emotional regret and self doubt that will stay with me for the rest of my life. Renee, as you are reading this, so is the owner of the previous salon, and I do hope you post this and the before and after photos on your website for the whole world to see. I want everyone to know that receiving PERMANENT cosmetics is not something to be taken lightly at all! Know that with the first inclination that something isn't right, it is time to get out of there as fast as you can! THIS IS PERMANENT, and everyone needs to remember that in their decision as to whom they choose to give them this service. I obviously suffered at the hand of one of the increasing number of people out there who are performing these procedures and should NEVER have been doing something that would affect people PERMANENTLY for the rest of their lives. I thank God for sticking by me and helping through this as well, and Renee, I, my face, and my self-esteem all thank you! You are truly an artist at what you do, as I now have the most beautiful brows and eye liner to prove it. What is equally important to me right now is the fact that you made this middle-aged woman, at a time when I was just embarking on a new era in my life, feel like I matter and that it's okay for me to proceed on this new adventure of improving my personal appearance. I wish you all the best, which is so due to you, in your future journeys and as you continue to touch others' lives in such a positive, endearing way. THANK YOU! To say that Renee is an expert in her field is an understatement. As a permanent makeup technician, I have had the chance to watch ongoing procedures and have also seen numerous end results. The first time I saw Renee in action performing a procedure I was so amazed and intrigued by her work. She stood out as a truly gifted artist as she effortlessly created a beautifully natural looking set of eyebrows on a lady who had no eyebrow hair at all. Since then I was able to undergo Renee's artistry. And, needless to say, I am more than happy and so excited about my new look. Renee has left her mark on me, and it is a beautiful one! I would just like to thank you again for fixing my eyebrows. Last year I went in search of a permanent make-up technician, and chose a lady that wasn't too cheap, but not too expensive either. I passed you up because of about a $100 dollar difference in price. Well, needless to say, she ended up really messing things up. She couldn't even design the brows herself, she made me do it. And then blamed it on me when they came out uneven and one being lighter and thinner than the other. I did not go back to her for my touch-up because I was afraid of what she would do to me this time. I finally came to see you, and you did an amazing job. My brows now look perfectly symmetrical and are the same color (a much better color at that), and you did a great job removing a portion of the old brow that showed underneath. I would definately recommend you to anyone I know considering permanent make-up, and I would also warn people against going to someone else just because they are slightly cheaper. Overall, I would have paid less if I had just gone with you in the first place and would have saved a lot of pain, stress, and embarassment. Once again, thank you so much for fixing my face, you are truly talented! Renee is a miracle worker! She is exceptionally professional and proficient as an artist. She corrected a terribly botched job on my permanent makeup eyeliner. The technician I had previously used had given me two "tails" on my eyeliner. It truly was a wretched mistake. Renee not only corrected it, she covered up the mistake and enhanced my eyes with a clean, crisp unblemished liner and a beautiful tint to the mucousal line that really brings out the beauty of the color of my iris. She is absolutely fabulous! Besides being an extraordinary technician, she is a very sweet, considerate and generous human being. I cannot thank her enough nor praise her highly adequately. 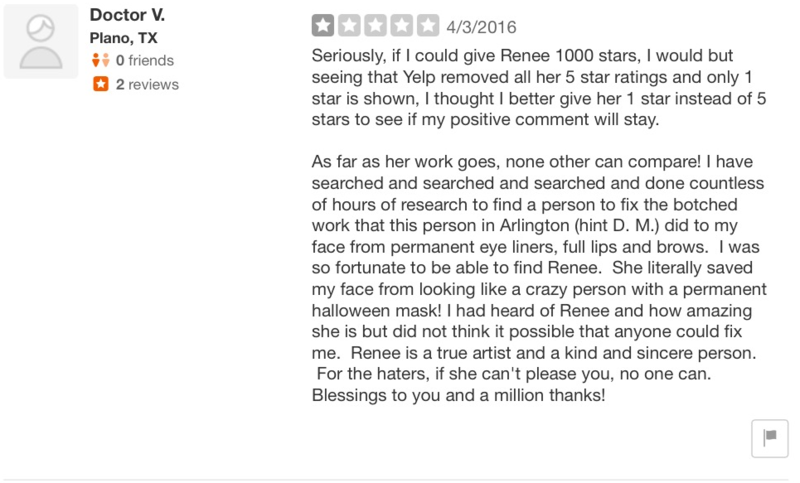 I recommend Renee to everyone who wants a perfect job, be it permanent makeup or body art, she settles for nothing less than perfection. Thank you and bless you, Renee!! The world is a better place for you being in it. Love, light and laughter to you always. I have been searching for someone to correct my permanent eyebrows for 10 years. I originally got my brows done in 1995 in Biloxi, MS. They were too dark and stark looking, the shape and color were terrible. I went to several consultations for color correction in Mississippi, but they only wanted to add color and not correct the color or shape. I did a search on the web for the last nine months to find someone to correct my brows and I found Renee's Timeless Beauty site. I looked at the photos of her work and I said to myself that I have to spend the money to go to Texas to get my brows corrected. I made an appointment originally for complete removal but Renee did a color correction and added hairline strokes to my brows and they are awesome. Oh my God! I can't believe how wonderful they look. This is a miracle! I have never been happier. It was worth the trip to Texas and the cost to have my brows fixed. Thanks so much Renee! I had a bad experience with a prior permanent eyebrow procedure. After searching for someone to correct them. Everyone scared me away with the possibility of losing my hair. I found Renee and my confidence is restored. Thank you Renee! I had a good feeling as soon as I met Renee. She was very confident during the procedure, and that helped ease my apprehension. I am so happy with my new look. Being able to get up in the morning and look in the mirror without looking washed out is very exciting. I like feeling pretty in the morning or after a long day. When I received my tattoo the artist really put the ink in deep. After the first session with Renee, she almost completely removed the primary section that I needed removed. I have to drive 2 hours to see Renee, but I wouldn't have it any other way. I couldn't be happier with the results that I've seen with Renee's process in such a short time. Being without eyebrows was a condition throughout my life. Sensitive, fair skin contributed to a lack of definition and color in my face. I was a "plain Jane". Then a friend suggested permanent cosmetic tattooing, I was definitely interested. My first experience was eyebrow enhancement. The process was long - 4 1/2 hours. Although fairly painless, there was considerable bleeding, swelling, and bruising. Ah, but I had eyebrows and they looked quite good. The next appointment, also over 4 hours, yielded upper and lower eye liner with the expected swelling, bleeding, and bruising. Although I was concerned with the bluish/purple bruises under my eyes, I was told that this is "normal". In time, they healed. Three months later, my eyebrow color began to fade from a dark brown to a light taupe. At six months, my eyebrow color was ash gray. In contacting the technician, I was told that we need to re-do them. So I did - at full price - for more swelling, bleeding, and bruising. This pattern continued for four years! Each time I was told that "because it is not a pure black pigment", it will fade. At that point, I questioned the "permanency" aspect of her procedures and the ethical question of charging full price for re-doing a PERMANENT cosmetic procedure within a few months. 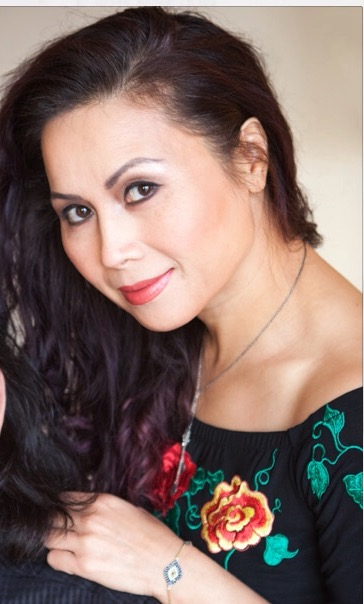 With yet again ash-gray eyebrows, I began a search for a truly professional permanent cosmetic artist and through the internet found Renee Cao. Located in Dallas, Texas, Renee answered my phone call with openness and a contagious enthusiasm for her work. She answered all my questions, fielded all my concerns and fears with positive candor and factual information. There was, however, a sizable obstacle. I lived in Chicago! No problem, insisted Renee, "I have clients who come from other areas of the country. We'll make it work..."
That was last December, this is May 18th and I had Renee's procedures for permanent cosmetic tattooing on eyebrows and eyeliners last Sunday. Amazingly, it took slightly over 2 hrs. for all. No bruising, no swelling, no bleeding - just a bit of pink at the site. I couldn't believe it! I was so excited and pleased with the results. Renee is not just a technician. She blends the artistic sense of color and shape, shading and contouring with the science of precision, hi-tech equipment, skin chemistry and facial morphology. Efficient and professional, Renee prepared my mind with the factual content of her procedures and she prepared my spirit with the support and encouragement of her aesthetic artistry. What began as a journey of trepidation and desperation has turned into an experience of enlightenment and re-newed faith in permanent cosmetic artistry. Thank you Renee, for restoring so much more than my facial features. Your expertise, character, and passion for helping people through your work has made this experience a complete success. Not only have I been given new eyebrows and eyeliners, I also feel as if I've been given a new and wonderful friend. Thank you Renee, you are amazing! Permanent Makeup, corrections, Alopecia, etc. Renee has documented an impressive body of work. After a botched permanent makeup session by another person, my dermatologist said I would need to find someone who did a dry needling technique with the application of an enzyme to pull color from the areas. She explained how I would lose natural color pigmentation if I used a laser. 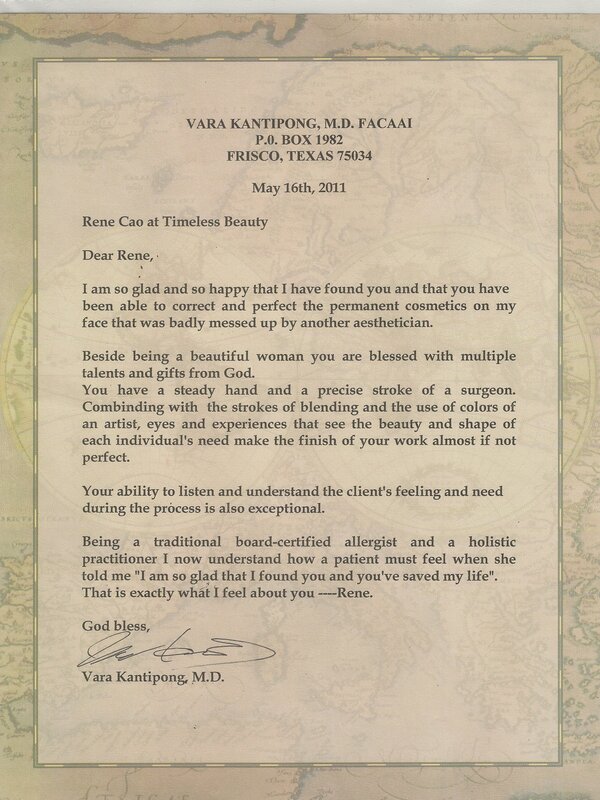 I found Renee's website, pored through photos of corrective work, permanent makeup, etc. and booked an appt. Renee conducted a consultation, explained everything about the procedure and cautioned me to expect an unpleasant experience. It was painful but the pain was worth it because the color started flaking off about 1.5-2 weeks later. Two procedures later, it looks 100% better. She didn't "camouflage" by adding additional tattooing, she literally removed the worst areas. Renee also said if I had found her immediately after the first procedure, she could have removed it completely. Renee's prices are higher than others, but cheaper does not mean better. Renee did make suggestions for other services - I agreed to some and declined others - though I never felt pressured. My confidence in her abilities is such that I have referred 4 others to her, and after seeing work she has done on Alopecia patients, I have put her in contact with the National Alopecia Areata Foundation. Do yourself a huge favor and put your faith in Renee's skills in permanent and corrective makeup procedures. My own testimony: Renee made me look beautiful again! 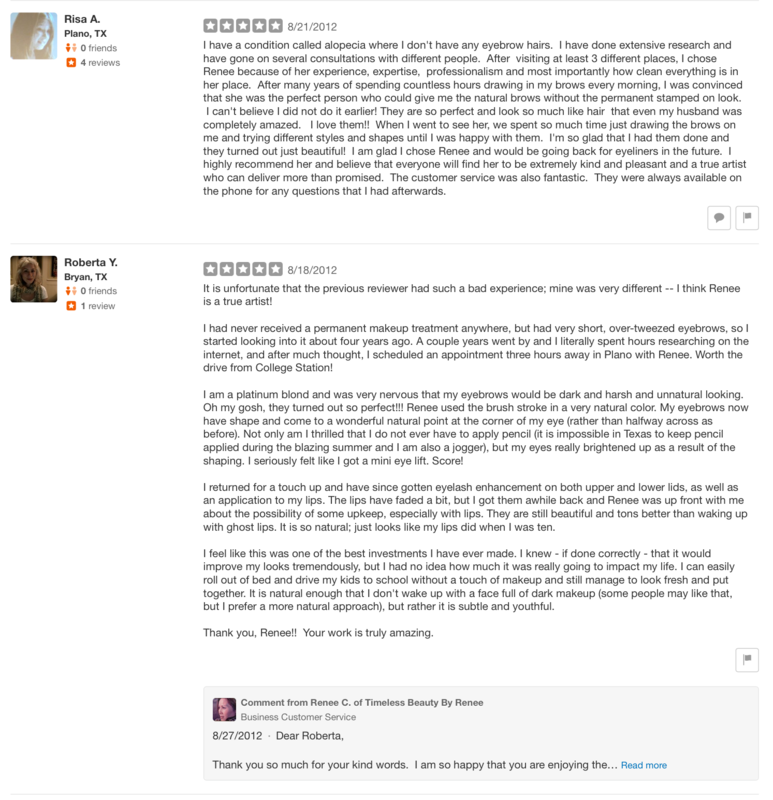 I would like to share my experience with Renee because of the astounding, if not miraculous, corrections she made to the nightmarish outcomes of 2 "professional" prior procedures. After several months of dissatisfaction and depression resulting from two permanent makeup sessions (one application by one woman and 1 correction by another), I had the good fortune of being referred by my dermatologist to a woman who does permanent makeup. She told me I would need to find someone who did a dry needling technique would use an enzyme to pull color from the area since I would lose all lip pigmentation if I used a laser on them and could not possibly use a laser near my eyes. I found Renee's website, pored through photos of corrective work, permanent makeup, etc. and though still nervous I called to ask questions. Felix took my call and proceeded to patiently answer all of my questions (which were many) while encouraging me to read the letters of testimonial (which also were many) and to look at the vast number of before and after photos. I felt a glimmer of hope and scheduled an appointment. Upon my arrival, Renee conducted a consultation with me and explained everything about the procedure, why my makeup looked like it did, what the other technicians (and I use the word lightly) had done and what result I could expect. She calmed me by assuring me she should could definitely make it better and even fix it. That thought was too good to be true since: (1)My right eyelid looked like Amy Winehouse's smeared 60s style eyeliner while also covering my entire lower lid, (2) I had 100s of odd dots of ink across my lower and upper lid, outside the corner of my eye and out past my eyebrow, (3)I had a "tail" which had bled/formed from the crazy sweep across my eyelid and down past the lower lid, (4)The right eye's eyeliner was roughly 1/3 the width of the other one with a U-shaped tail coming up from the end and up toward my eyebrow, (5)The lip liner was far outside the lines of my already full lips and undulated in a snakelike pattern across my top lip before continuing a lopsided journey across my lower lip where it cut up and across the middle of it. I had been using pancake makeup to try to cover up the embarrassing and disastrous results. Renee prepared me as to how painful removal can be and apologetically cautioned me to expect an unpleasant experience. I stiffened my resolve and completed the procedure. The smell was horrific and she explained to me that the other technician had used India Ink instead of pigment and she had obviously used a large bore needle in trying to apply it (thus the dots). I left with stinging, puffy eyes and lips and complete instructions as to how to care for them. I was also encouraged to call if I had any problems and was scheduled for a follow-up appointment. Several days of swelling later, I rejoiced as I saw huge swatches of ink-blackened skin flaking away. I felt much more upbeat at my following appointment and we did another painful removal. At this point the pain was worth it because I was seeing irrefutable results! Two procedure later, I look more like myself than I have in the 8 months previously and I actually feel good about my appearance again. I have since bought a laser package with her (loving the results) and will be scheduling permanent makeup procedures to further improve and refine the others' shoddy work. My entire experience with Renee and Felix has been professional, collaborative, reassuring and pleasant. Both appear to genuinely care about their clients and want to help them. Renee was incredibly sympathetic and empathetic upon hearing my story since she had a similar experience. She shared that her own was the catalyst for her career choice. In closing: Renee's prices are higher than others, but I found out the hard way that cheaper does not mean better. I guess it is the equivalent of buying a velvet painting of Dogs Playing Poker or buying a Monet. Since this is my face, I want the Monet! Additionally, Renee did upsell me but there was no pressure for me to agree. She is a business owner and this is her sole means of income, so it is not only prudent to offer other services but also sound and savvy business acumen. Renee made suggestions for other services - I agreed to some and declined others. I never felt pressured, harassed or uncomfortable. I cannot fully express the comprehensiveness of my endorsement other than to share this: I have referred my sister to Renee for permanent eyebrows and eyeliner (she has had two bad experiences also), my mom for an aesthetic procedure as a result of her surviving breast cancer, my hairdresser who LOVES my makeup now and a friend who wants the ease of impromptu errand runs without applying makeup. I wanted to let you know how amazed I am by the results of the Laser Genesis procedure. All of the redness in my cheeks has disappeared, my pores are much smaller and the fine lines around my eyes are less noticeable. Yeah! I would recommend it for anyone who wants to look younger and even out their skin tone. Look at ME!!! Don't I look terrific!?! No, I'm not conceited. You see, for a very long time, I was embarrassed to even hold my head up in public places. I was so self conscious about the damage on my face that I had a difficult time looking people in the eye. Thanks to Renee Cao's God-given and carefully honed talent, I not only feel comfortable holding my head up in public, but I actually am confident about my appearance. My face, once marred with red bumps, scabs, scars and blotchy permanent makeup, is now glowing with radiance that I feel all the way on the inside. I originally came to Renee for permanent makeup correction on my brows and lips. I was nervous about undergoing permanent makeup procedures again because the previous ones were so painful and time consuming. I had tattoo needles poking me for hours only to end up with embarrassing looking features! When I had my consultation with Renee, she was professional and spoke with competence and confidence about how she would go about fixing my brows and lips. You can see for yourself that Renee successfully corrected my permanent makeup. She worked with swift precision which rendered the desired results. What's more, Renee has turned my skin from Gag! to gorgeous. I battled acne for 20 years. After seeking help from doctors, dermatologists, estheticians, herbalists, etc., and after trying everything from ProActive to oral antibiotics and acutane, I had lost all hope that I would ever have nice skin again. I wasn't trading acne for wrinkles; I was living with both acne AND wrinkles at the same time! I am walking proof that even when all hope seems lost, there's still reason to have hope. When she saw the trouble I was having with my skin, Renee mentioned that she could make my skin beautiful again. Since she did such a great job with the permanent makeup, I decided to give her a try with my skin. I'm so glad I gave Renee the chance to help me because now, you can't even tell I ever had any trouble with my skin. Again, just look and see for yourself. I am walking proof that Renee knows what she is doing. I trust her with my face because she has rightfully earned my trust. I will continue to use Renee's skin services as long as I am able. Dear Renee, I am so happy to have met you. Thank you for making my skin look so fantastic! I have been make-up free for weeks. My eyelashes look fab too! You have a loyal client in me. I learned so much from spending 2 days with you. You helped me refine my technique plus you taught me a lot 'pearls'. I have gone and paid for 2 different instructors before seeing you. I have to say - I learned the most from you. You also taught me how to correct mistakes. Thanks a million !!! Renee is very knowledgeable. I have total confidence in her, both as an instructor and as a permanent makeup technician. I was never one to mess with my eyebrows, and now everyone says my eyebrows look great. It suits my lifestyle wonderfully! Your artistic genius and attention to detail is reflected in every procedure you complete...You are truly the best permanent makeup technician, and the only way someone could compete with your level of perfection is to be trained by you. You are truly an amazing artist, technician, instructor and person! I am very pleased with the final result of the eyeliner. Thank you for your indulgence in my need for perfection. I definitely came to the right person! Renee has the confidence and attention to detail that only a very well trained professional can provide. I first visited Renee to camouflage some scarring from a mole removal that a family practice performed. For a long time a mole on my lower eyelid had bothered me as well, but I was afraid to have it removed due to my prior experience with the family practice. Renee assured me that she could remove it without leaving an embarrassing scar, and sure enough, I can barely even tell it was there now. Allowing Renee to perform this procedure was one of the best choices I've made. I was lucky enough to walk in on a day that Renee had a cancellation. I was there to research permanent eyeliner . That very day Renee was able to give me permanent eyeliner, as well as, lash enhancement. The procedure was virtually painless and it is perfect! I love, love, love the way it looks, the way it saves time, and the way I look the first thing in the morning and after swimming. While I was there, Renee told me she could also remove the large cholesterol deposits (that no makeup could cover) I had developed in corners of both my eyes. The result is amazing. My eyes look normal again. Thank you, Renee for everything! Renee -- Glad I have you in my life! I look so much better for knowing you. A super happy client! 2.) an experienced artist that pays attention to precision. I was lucky enough to discover both in Renee. When I went in, she numbed me up with cream. Consulted with me regarding the exact way I wanted the eyeliner to look (color, intensity, shape). When she did the actual procedure, she kept talking to me and ensured my comfort. Honestly, I didn't feel anything but buzzing and minor discomfort when she would run the machine towards the inner corner of my eye. I noticed when she felt that I was uncomfortable, she would start talking to me to keep me calm. She truly cares about you and wants the best. Her fine, Asian hands hold a lot of talent in them. She is really good at what she does. The other thing I like about her is that she wants to make sure you are fully satisfied. When I went in the first time at my follow up visit, there was barely any ink that showed up in my eyes. Initially, I was a little disappointed but she reassured me that she would do a touch up and put more color in. Sure enough, she did just as I wanted. But at my foliow up, my right eye had a minor allergic reaction and swelled up a bit. I called her and informed her of this. She was genuinely concerned and asked that I keep her posted regarding the situation. Thankfully, the puffiness went away on it's own within a few days. I am now looking forward to probably my final touch up to add a little more color. She does a great job and listens to what you want. After allowing time to heal she will tweak things as desired. She's also well known for correctional work (lop sided tattoos, removals). She is a multi talented woman that also performs many other beauty related things such as: laser treatments, facials, microdermabrasion, make overs, treats skin conditions such as acne and rosacea. My experience has been great with Renee! I would definitely recommend her! After months of internet research on Permanent Cosmetics which spanned across the entire country and included hundreds of websites and salons, I found myself at Timeless Beauty by Renee. After having a botched permanent cosmetic lip color performed in Michigan, I found myself not only needing removal of the existing ink, but for the entire procedure to be redone. Renee is second to none in her skill level and ability when it comes to permanent cosmetics. Her attention to detail and strive for perfection and symetry is absolutely unparalledled. For Renee and the staff at Timeless Beauty by Renee your customer experience starts with the first phone call and does not end until you are happy and satisfied with your results. Unlike many of the other permanent cosmetic salons you will find, all of the pictures that Timeless Beauty by Renee shares are of Renee's work only! I could not be happier with the service I have received and am forever grateful for Renee and Felix for the role they have played in my life! Thank you for all that you have done. 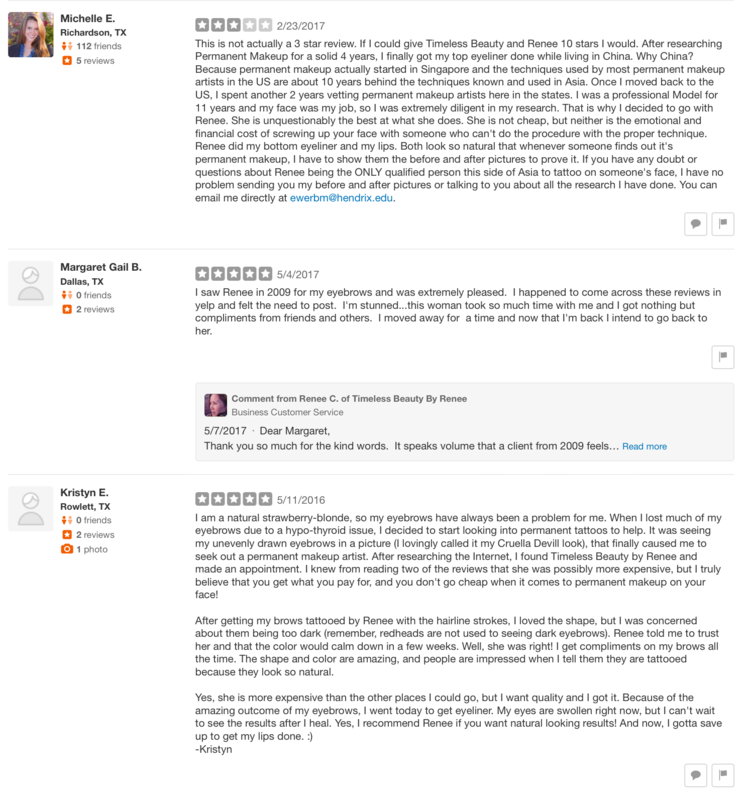 Lately, our company has been bombarded with phone calls from the Yelp advertisement department to advertise with them. They promised to get our company to their top spot and increase traffic to our website. We declined and noticed that all of our 5 star ratings from actual clients were filtered out. 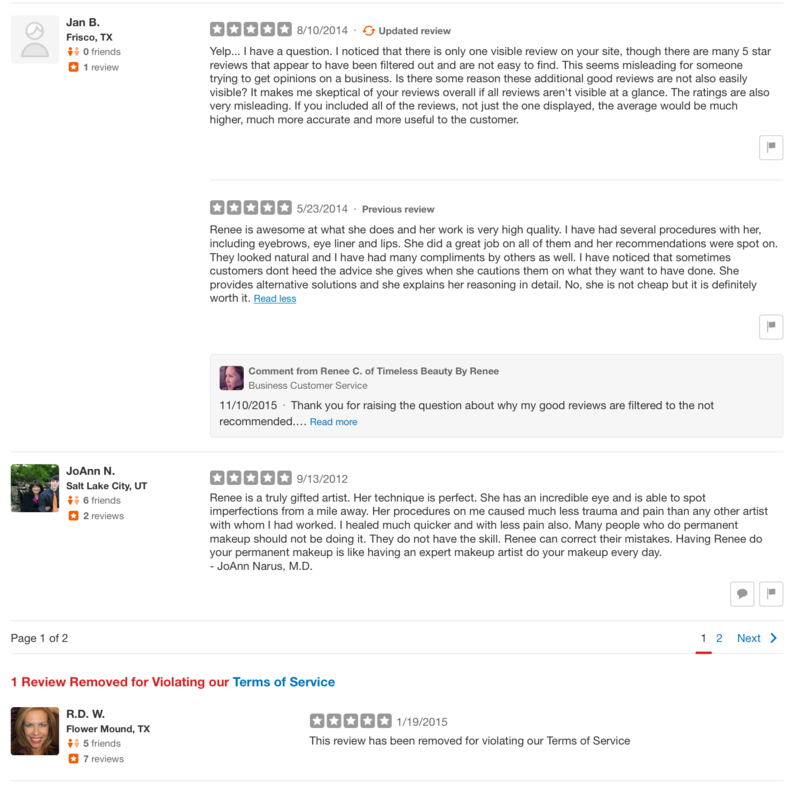 We also noticed that our competitors that are paid sponsors of Yelp were at the top ranking and their negative reviews were fraudulently filtered out. Please be extremely careful with deals from Yelp and Group On that appear too good to be true. Quality work is not cheap and cheap work is not quality. You have only one face, trust it to the best. Many of our clients are victims of botched up work. Do your research with a reputable company such as the BBB; or personally go check the business out speaking with actual clients and viewing before and after photos; or schedule a consultation. 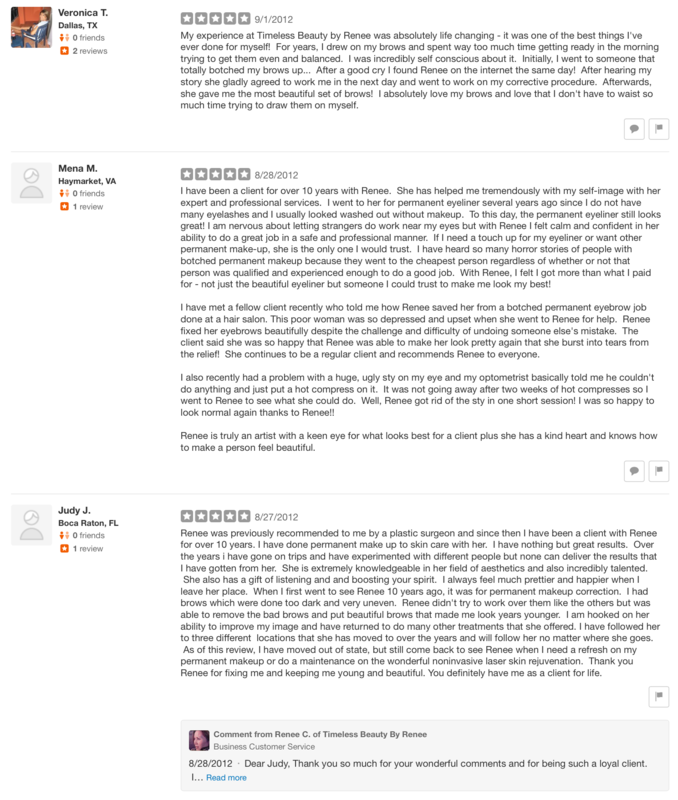 Below are additional reviews that were written up by our clients in Yelp that were filtered out.